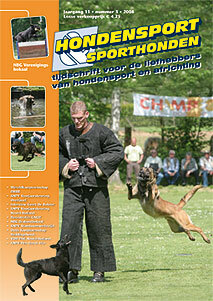 INFORMATION ABOUT THE MAGAZINE "HONDENSPORT EN SPORTHONDEN"
For one full year : € 35,00. Remember the NET amount of € 35,00 ! For one full year : € 50,00 (euro). Payment by bank deposit (see account number above) is possible but remember that the costs the bank charges, are always for the account of the subscriber. The first issue of this bi-monthly mainly full-color magazine was published in the middle of December 1998 by the Dutch firm 'Topaaz Publishing'. 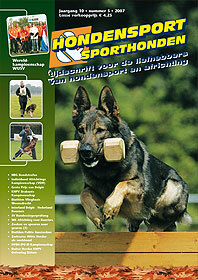 The topics of "Hondensport & Sporthonden' concern only working sport- and professional dogs. In each item there will be full-color articles, reports, interviews with tophandlers and comments about KNPV, IPO, Schutzhund, Professional dogs used by police, customs, airforce and so on, Tracking dogs, Ringsport dogs and more purely about working dogs. Never before was such a magazine published in Holland or anywhere else in the world, but nowadays daily practice proves the need for it. The reactions in and outside Holland since the beginning are really overwhelming !! Nowadays there are subscribed readers of "Hondensport & Sporthonden" from all over the world, in countries like Germany, Austria, Croatia, U.K., Denmark, Finland, France, Italy, Norway, Sweden, Spain, Switzerland. But also outside Europe people are interested in view of the many subscriptions from the USA, Canada, Mexico, Australia and several other countries.